The Ampelmännchen or the East German pedestrian traffic light symbols have been created in 1961. After the fall of the Berlin Wall, the Ampelmännchen acquired cult status and became a popular souvenir item in the tourism business. They became a virtual mascot for the East German nostalgia movement and today, not only it had reappeared but variations have been added like the female counterpart created in 2004 by Joachim Roßbergby. In 1996, Markus Heckhausen founded the Ampelmann GmbH company to promote those characters through various objects. 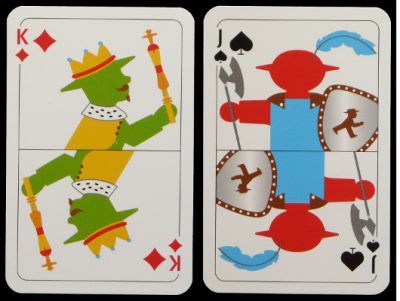 Two packs have been published, “Glücksspieler” (gamblers) with 32 cards and “Falschspieler” (cheaters). Price and where to find: € 5 from Ampelmann shops or large bookshops in Berlin. Available from Internet web shops.